Me, Beloved, and friends celebrated one of our friend’s birthday at Don-Day. 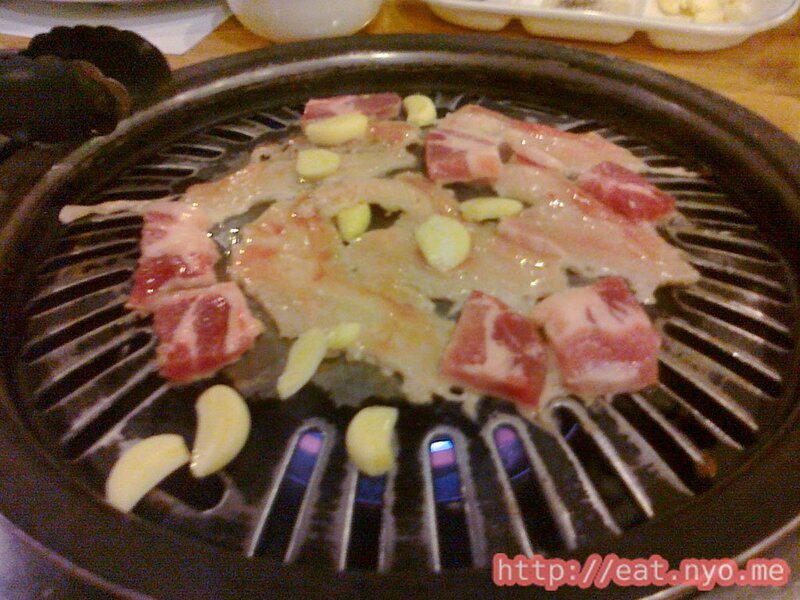 This Korean barbecue place is located right across Pino, a walks way from Maginhawa Street. We’ve been wanting to try this since we’ve heard about it, especially when we learned about its price. Anyway, the place itself isn’t really praiseworthy. It looks like your usual open-air pares place devoid of air conditioning. However, upon entering, you are greeted with a whiteboard menu boasting it’s small selection. On top is the Samgupsal Buffet, priced at 299 Php. 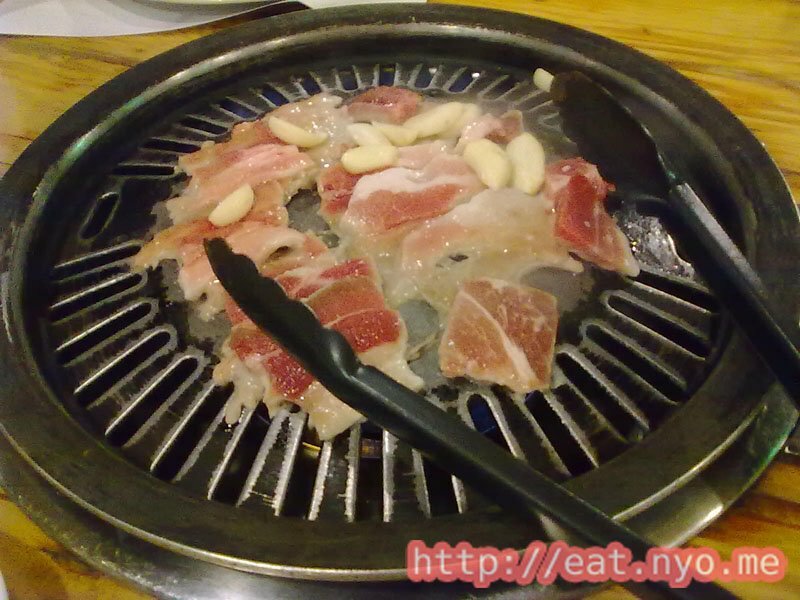 This consists of a buffet of Korean food fare plus unlimited pork for you to grill at your own table, similar to YakiMIX or, perhaps more appropriately, to Sambo Kojin, only much, much more affordable. 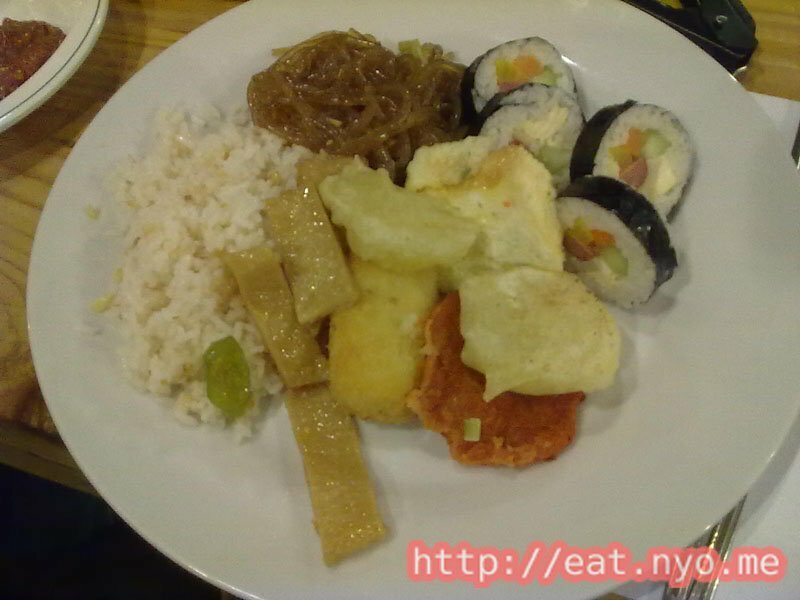 They also have the Don-Day Buffet priced at 199 Php selection which removes the said unlimited pork, and just provides with a buffet of regular Korean food fare. 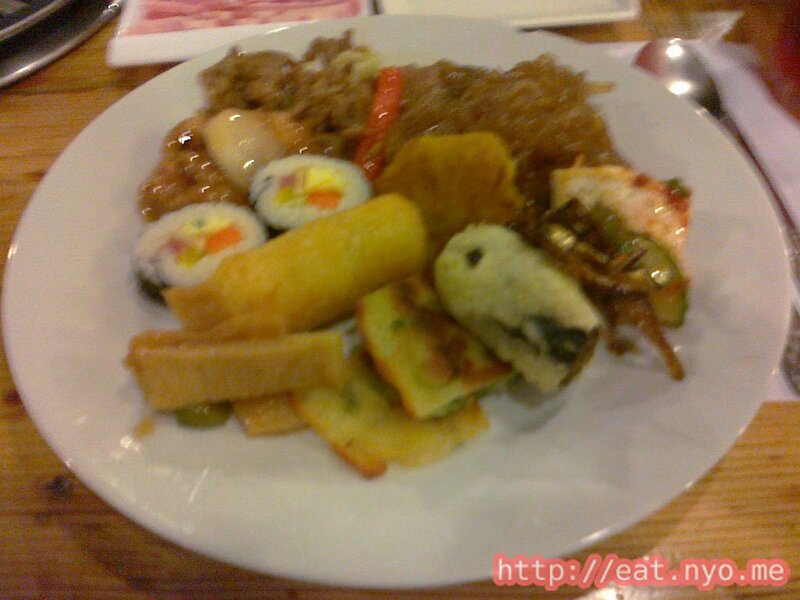 Since it was a celebration, all of us went with the Samgupsal Buffet. Since this had the meat in it, the servers started cooking up our first batch of pork with garlic. We were courteously presented to the buffet itself, which, sadly, didn’t have any labels, so I’m not sure what I got. To remedy this dilemma, I just picked a sampling of everything that could fit my plate minus rice, since I wanted to eat a lot of meat. Sorry, but I don’t really have any definite idea what I got, except for a few things. Their Chap Chae, or glass noodles, was my favorite. They also had beef Bulgogi and Sweet and Sour Pork, which weren’t bad as well. My friends loved the potato croquettes, but I found it a bit bland, although it was admittedly soft and potato-ey. They also had some Korean Pancakes and Rolls, which weren’t bad as well. I guess the others were some sort of tofu dish. What’s great is all of them were pretty good, albeit a bit cold. Beloved got a sampling of what she fancied. She got plenty of the battered veggies and rolls. Also, she got some of their garlic rice. Of course, the main star of the night was the meat. Why? Because there’s no limit to it. The servers keep on giving us thinly sliced pork belly, which happens to be my favorite part of pork, and we grill them. We could eat them as is, dipping them in the sesame oil and pepper sauce they gave us, or we could wrap them in the different vegetable leaves they have, smear on some hot and spicy paste, add a bit of kimchi and perhaps some radish and garlic, and consume as you would a sushi roll—in a single bite. Either way was delicious, and I found this a much more enjoyable grill-on-your-table experience than Chophouse, especially since you can eat a lot of meat due to the veggies. While I could’ve gotten a couple more plates of pork, everyone else were having their desserts already. 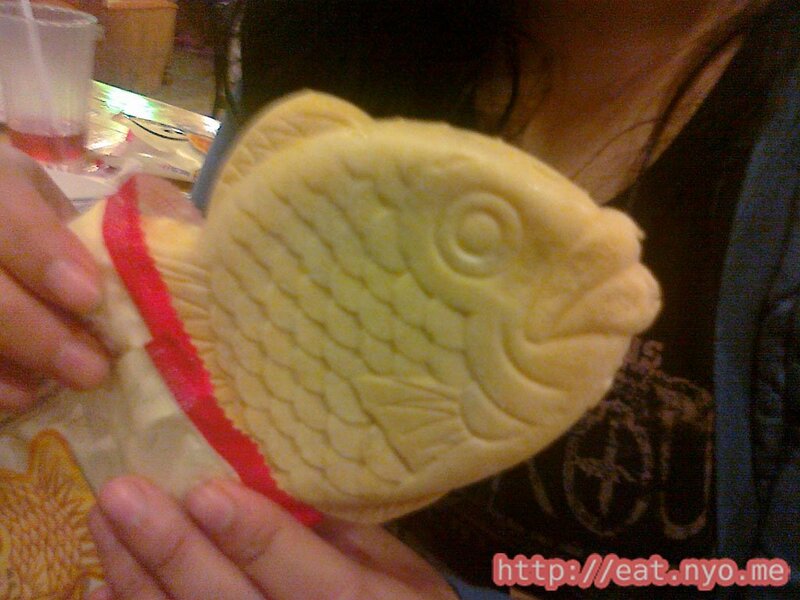 So I bought mine as well—a Korean Ice Cream that was shaped like a fish, priced at 40 Php. The ice cream itself, vanilla, was inside a pastry dough, shaped like a fish, and was topped with red beans. It’s one of the more enjoyable desserts I’ve had, definitely much more than a cup of frozen yogurt. All in all, it was a pleasant stay. Sure, it’s not a closed and air-conditioned place, but it was cozy and had that homely feel to it. Their servers were as pretty as your average yaya, but at least they were courteous and always wore a smile despite being seemingly overworked handling all the tables. Their food wasn’t gourmet and beautifully decorated, but they were all delicious. 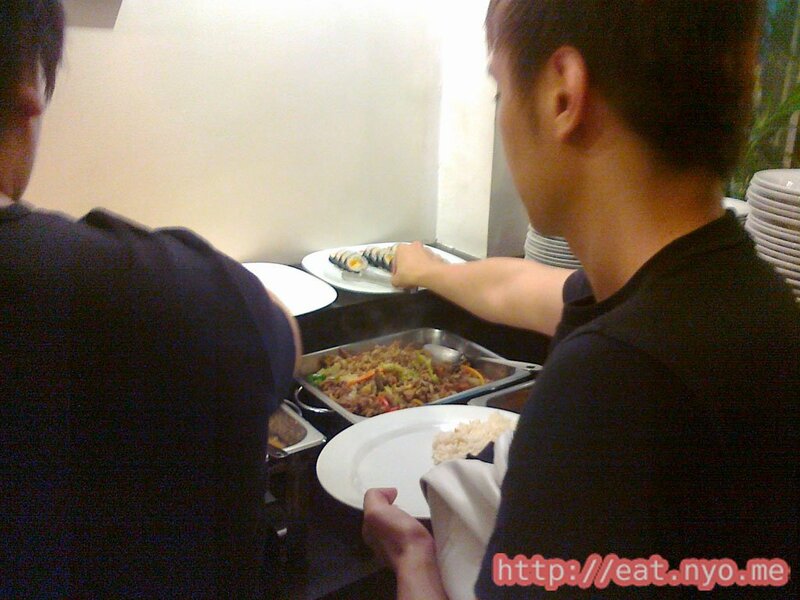 Their meat is the cheaper pork rather than the usual beef, but I personally find pork much more delicious than beef. Sure, there were a couple of cockroaches scuttling about, but due to the open place and the affordable price, I can live with that (rats would definitely turn me off, though). Finally, while they didn’t have much variety in their meat compared to the larger, more expensive yakiniku places, the fact that you have the veggies and sauces to accompany it cancels it out. My only disappointment was I didn’t get to eat as much as I wanted to, but that was because everyone else was full, probably because they had more potatoes and rice than I did, and I didn’t want to look destitute. Also, this gives me a reason to go back, and Beloved and all my friends agree, reasons might vary. Indeed, we might have found a place to frequent in Don-Day. Recommended for: Pork, Korean food lovers. Not recommended for: Pork, Korean food haters. Smart nomnomnom tip: Go easy on the starch so you can have plenty of meat.